Note: Updated on 05th of March 2015 with information on SQL Server 2012. Having blogged a couple of times on the matters of Segment Elimination (“Data Loading for Better Segment Elimination”, “Deleted Segments Elimination” ), I decided to go 1 step deeper in this direction and see which data types support segment elimination and which not. Warning: you will see different values, since the data I have loaded is pretty much random. From the picture on the left you should be able to see that I have different data in the listed segments and so I can actually execute queries expecting Segment Elimination to take place. You can clearly see that the expectation for the following Data Types (binary, varbinary and uniqueidentifier) is pretty low - even though they have distinct data values, they show through sys.column_store_segments DMV that they do not have any values different to 0. This is the execution plan for the above query, you can see that we have only the essential elements with no Filter iterators. The absence of the parallelism iterators (and hence the batch mode if you are wondering) is explained by the low query cost - the whole subtree in my case is estimated to the value of 0.913655. You can clearly notice that we have a predicate well defined, it is written under the table of the Columnstore Table Scan - [Columnstore_Play].[dbo].[MaxDataTable].[c1]<CONVERT_IMPLICIT(bigint,[@1],0) . There is no residual predicate and the execution plan does not include any additional filters - everything is fine. where c2 > 4. and c2 < 15. 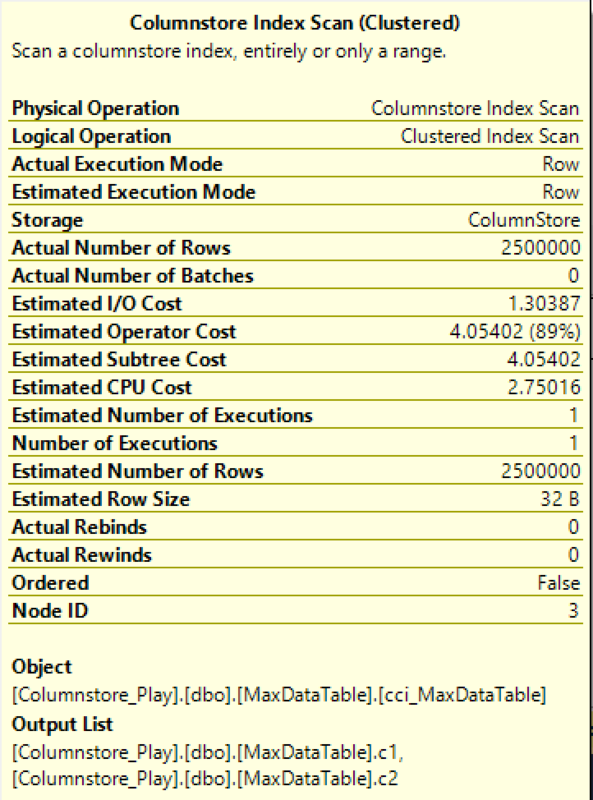 If you look at the execution plan, you will notice 2 important things - we are reading too many rows from the Columnstore Table (we are reading them all actually - all 2.5 Million of them) and the new iterator Filter which is actually doing all the work, filtering 69839 rows in my case. In case you are still wondering, there were no events of segment elimination in my Extended Events session which serve as an additional proof that the Numeric values are not supported for Segment Elimination. Now to the one of the most interesting & probably less useful Data Type - the bit. As you might remember, I have set the column C3 equals to 0 for the first Row Group while the second and the third ones include both 0 and 1 values. 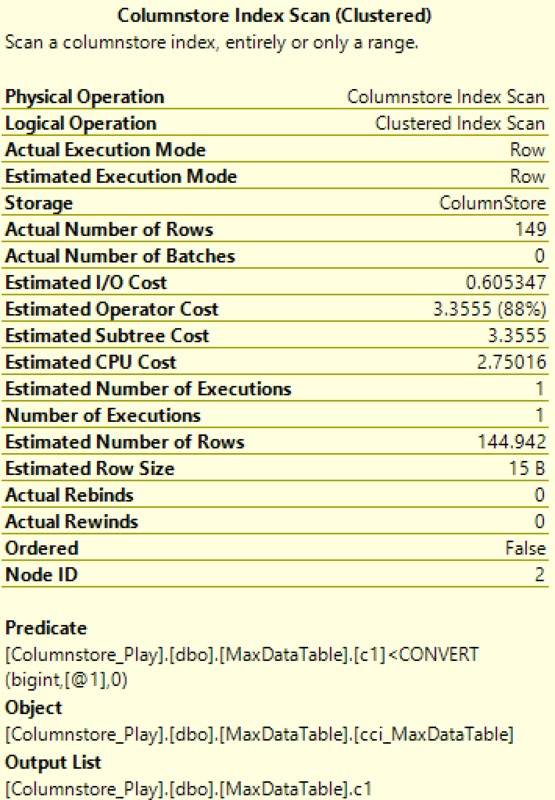 The actual execution plan includes the very same iterators, as the one with Integer Data Type, with number of values being passed from Columnstore Index Scan to Stream Aggregates being equal to the maximum number of rows in a Row Group - 1048576. Extended Events confirm what is also visible from the execution - that the Segment Elmination took place for this Data Type. From the table above we can see that should the Data Type not support the predicate pushdown operation, then obviously there is no Segment Elimination for the Columnstore Indexes and thus the overall performance of the queries should suffer significantly. The difficulties with the Character Data Types are one of the areas where Columnstore Indexes could improve in the future, since SQL Server 2012 it is known that the performance with those types is a major problem. Numeric Data Type appears to be one of the 2 major outsiders and as far as I am personally concerned - the biggest one. It should not be completely impossible to solve this one and I would hope that the next SQL Server version shall include support for it. The surprising situation with DateTimeOffset Data Type is something that is quite unsurprising, since this is not one of the most popular & frequently used Data Types out there. I think that besides focusing on including some of the not supported Data Types such as CLR and (N)Varchar(max) the development team should focus on improving the performance of the existing data types. Would be nice running these tests on the latest Azure preview as well. They made some CS improvements. I ran the tests on Azure SQLDatabase and at the moment I could not find any improvement for the Data Type support. Greetings Niko — Another thorough writeup! One nit: The difference between c2 and c5 in your example is not about decimal vs. numeric (SQL rarely distinguishes between the two), but about declared precision, 18. Same deal with datetimeoffset, where the boundary precision is 2. (P.S. I work for Microsoft). thank you very much, your help is truly appreciated! So just to be clear — segment elimination for decimal & numeric types with precision over 18 is currently not supported in SQL 2014 (as of the current release, SP1)? to my understandings, there is no support for Segment Elimination in SQL Server 2014 at all. It all starts with no support for predicate pushdown (is it coming for SQL Server 2016? :)) for numeric data types, and it does not really matter what precision do you use. can you explain me the difference between segment elimination and predicate pushdown? Segment elimination happens when we avoid reading Columnstore Segments and Row Groups, while predicate pushdown is a way of doing data processing at the deep level of the storage engine, without pushing the information into the memory and processing it later. For aggregation or filtering this does miracles. Thank you for your great blog post series. I learned a lot from it. We are using Columnstore index for one of our fact tables and I noticed that Aggregate pushdown doesn’t work for float/real data types even though they fit in 8bytes (64bit) size limit. We are running Microsoft SQL Server 2016 (SP1-CU3). I wonder if I miss something or it is a big. Have you experienced anything like that? You have written that the data types FIT into 8 bytes Float/Real, but are they declared as such ? Can you please share the column definition ? I would appreciate any insight from you. interesting, I have confirmed that Float & Real are not supported. I thought that there were just other prohibitive limitations for them, but they are a no-go for way too many situations. I expect the docs to be updated soon. Regarding Numeric data type, only when it hits 19 precision, will it occupy 9 bytes – the docs are borked again, but before it was well written there, I believe. I have been showing it in my workshops for quite some time. Thank you Niko. I hope it is not a documentation issue, but a bug which should be fixed ;).